The "Cornhusker State" is home to 31 institutions of higher education, including 16 private universities, 7 public colleges and 8 community colleges. Ranging from private liberal arts institutions like Creighton University to large public schools like the University of Nebraska at Lincoln, students have a range of options to choose from to match their unique needs. The state currently enrolls nearly 140,000 students, though Nebraska's Coordinating Commission for Postsecondary Education is currently working aggressively to increase that number. Regardless of the type of school or degree level students are seeking, we have applied our rigorous methodology to the latest education data to rank the best colleges in Nebraska, including the top four-year and two-year schools. Four-year institutions in Nebraska enjoy a long and prestigious history; Peru State College, the oldest institution, was founded in 1867 and is still an active public liberal arts college. Recognized as one of the top 10 states in the nation for the percentage of public and private high school graduates attending college, the state is constantly working to expand and better its educational offerings. Fees and tuitions vary according to institution type: the University of Nebraska at Lincoln offers the lowest in-state tuition at $6,840. Creighton University, a private institution, topped the list of fees at $33,796. Though the national average for student debt upon graduation sits at $33,000, graduates of Nebraska institutions average only $26,490, a significantly lower amount. Based in Gering, Summit Christian College offers academic programs that help students build ethical understanding and leadership skills. SCC stands out among other colleges in Nebraska because it exclusively offers bachelor’s degrees in Christian ministry and biblical studies. Students interested in transferring to a four-year college or university can enroll in the associate of arts in biblical studies. The school also offers a certificate in Christian foundations. SCC provides asynchronous online classes through its BRIDGE platform. Candidates may earn their degree through a hybrid learning structure by taking up to 49% of their coursework remotely. General admission requirements include a minimum 2.0 GPA and an ACT score of 18 or SAT score of 850. These may be waived for transfer and international students and applicants over the age of 25. UNL is one of the largest and most popular institutions of higher education in the state. The school offers over 200 degree programs through its nine colleges, from undergraduate work in applied climate science, supply change management, and women’s and gender studies, to graduate programs in areas such as agricultural economics and nutrition, among many others. As expected of one of the best colleges in Nebraska, UNL is part of the Big Ten Conference, the oldest Division I collegiate athletic conference in the U.S. The university is also part of the Big Ten Academic Alliance, the largest organization of research universities in the country, which allows students at these schools to gain funding for research as well as present their projects to an audience of peers and respected experts in the field. UNL also has a respected law program and offers opportunities for nontraditional students through its Office of Online & Distance Education. Located in Omaha, Clarkson College was originally established in 1869 as a nursing school and hospital. Today it is a private institution of higher learning offering a variety of undergraduate, graduate, and professional training programs. Students can gain knowledge and skills in fields such as imaging informatics, administrative management, and healthcare services. Curricula are created to meet industry standards and are based in hands-on learning, preparing graduates for gainful employment in their fields. Like other colleges in Nebraska, Clarkson offers distance learning options and several professional development courses, so working professionals and other adult learners can pursue study that leads to certification or other forms of specialized recognition. Student life at Clarkson is diverse and engaging, from suite-style campus living accommodations to the opportunity to participate in clubs intramural volleyball and national organizations like Sigma Alpha Pi, the National Society of Leadership of Success. Financial aid is available, including scholarships of minority and military students interested in nursing. Creighton University is a Jesuit institution of higher education that enrolls over 8,000 students annually in undergraduate, graduate, and professional studies programs. In addition to the many traditional bachelor’s and master’s degree tracks offered, students will also find more specialized pathways that either supplement or replace the conventional programs. The Magis Core Curriculum, for example, prepares undergraduate students for further schooling or career placement after graduation by building such fundamental skills as communication and ethical decision-making. Students may also opt for Creighton’s pre-professional study, which prepares them for the competitive application process to medical, dental, or law school. Research is an important part of the Creighton mission, and the school spends over $26 million annually to fund student, faculty, and community projects. Academics aside, Creighton is one of the best colleges in Nebraska in terms of student life. From Greek societies to clubs and organizations that encompass a wide array of cultural, political, athletic, and social interests, any student will be able to find their place in the Creighton community. Bryan College of Health Sciences is distinct from other schools in Nebraska for its emphasis on health professions. All programs are related to health care professions. Undergraduate options include nursing, health professions, sonography/ultrasound, biomedical sciences, and healthcare studies. BCHS offers a master’s degree in nursing and an RN-to-MSN track. Additionally, the college offers two doctorate degrees and three certificate programs. Because the health sciences require intensive hands-on skill training, BCHS boasts state-of-the-art laboratories and simulation centers. Students receive support from their departments and the Student Success Center when engaging in clinical hours, job shadowing, and internships. Application requirements, such as minimum GPA, vary by program. All students pay a flat and affordable tuition rate regardless of residency. Program-specific scholarships and other forms of financial aid are available. UNK was established by the state legislature in 1903, and over the years has evolved into a comprehensive four-year college, offering degree and certificate programs in areas such as interior design, educational administration, modern languages, and computer science. UNK also accommodates nontraditional students through its eCampus, which offers a selection of the university’s programs completely online. The school stands out among other Nebraska colleges for its +9 post-master’s coursework pathway, which allows accredited teachers with a bachelor’s degree or higher to take three courses in career-developing fields of study like special education and instructional technology leadership. Tuition is based on program status, with state residents paying $182 per credit hour. Students at UNK enjoy a vibrant campus life and access to academic and professional opportunities, including enrollment in fraternities, sororities, and national honors societies. They can also find funding and guidance for their projects through the Office of Undergraduate Research & Creative Activity. Grace University is located in Omaha and has a history that dates back to 1943, when it became a Bible institute. Grace offers academic programs at the undergraduate and graduate levels. Bachelor’s degree options include English, intercultural studies, music/theatre, nursing, psychology, and business and technology. Grace also offers master’s programs in teacher education, Christian ministry, and counseling. Unlike many other small colleges in Nebraska, Grace operates a robust distance education platform. Students can take many classes in an asynchronous online format, completing certain bachelor’s degrees entirely online. Learners also have the option of completing degrees through a hybrid format. All students enjoy affordable tuition rates regardless of residency status. Grace provides financial assistance, including grants that are based on the student’s high school GPA. The university also supports its students through personalized academic advising, counseling, and career services. Founded in 1908, UNO is a metropolitan research school that enrolls over 15,000 students annually. UNO is large and comprehensive, allowing students to pursue most any degree program, from global information operations and real estate to urban studies and creative writing. Distance learners can take advantage of the online course options, allowing them to complete their degree flexibly while enjoying the same services, like academic advising and library privileges, as their campus peers. Extracurricular and co-educational opportunities are abundant at UNO. Qualified students, for example, can join the University Honors Program, where they enjoy such benefits as early registration, membership and networking opportunities through the National Collegiate Honors Council, and the opportunity to receive a full scholarship. Military students have access to similar benefits through their own learning community. UNO also boasts the lowest tuition rate among the top four-year Nebraska colleges, with state residents paying roughly $206 per credit hour. Located in Omaha, the College of Saint Mary has since its inception in 1923 been an institution dedicated to educating and empowering women of all backgrounds and creeds. Saint Mary offers several academic programs, from undergraduate degrees in human biology and paralegal studies to graduate degrees in teaching and organizational leadership. Extracurricular and co-educational opportunities are abundant, including the Walk Tall Honors Program, college athletics, study abroad, and service learning opportunities like the Spirit of Service Day and Alternative Break Trips. True to its mission of providing education to all women, Saint Mary is one of the only colleges in Nebraska to have lowered its tuition in recent years. Undergraduate students now pay less than $20,000 per year and no one is turned away after acceptance based on her financial situation; the school will do everything in its power to help you get the education you deserve. High school juniors and seniors can also take advantage of Saint Mary’s academics by participating in dual-enrollment, paying only $100 per credit hour. Located in Lincoln, Wesleyan was founded in 1887 and today offers more than 108 academic and professional programs to students of all backgrounds. From bachelor’s degrees in theatre design, philosophy, and exercise science to master’s degrees in nursing and business administration, chances are the degree you want can be found at NWU. Like other big colleges in Nebraska, NWU also prepares students for rigorous graduate work in the fields of architecture, law, engineering, and health. Those interested in the healthcare field can further prepare for their future by specializing in a subfield such as optometry, medical technology, and veterinary science. NWU is dedicated to its students’ professional and personal growth. Not only does the school offer ample opportunities by way of internships, research, and study abroad, it is also dedicated to helping students graduate. Through the Graduation Commitment, undergraduate students in the College of Arts & Sciences who follow the guidelines but are still not able to graduate in four year or less can take up to 16 credits free of charge. Located in Papillion, Nebraska Christian College of Hope International University serves students of all backgrounds and offers accredited academic programs that emphasize academic and professional development. NCCHIU stands out from other schools in Nebraska for its strong focus on ministry. Students may choose from six undergraduate degrees in the field. Bachelor’s options include human development, business administration, and liberal studies. The college also offers six graduate degree programs that can be earned entirely online through asynchronous coursework. All students have access to financial assistance, which includes state grants and institutional scholarships based on SAT/ACT scores and a maintained GPA. Students may engage in athletics, join clubs and organizations, and attend rural church conferences and the Student Leadership Summit. Home of the Broncos, Hastings College is a private institution that enrolls over 1,200 students annually. Located on 120 acres of scenic land, Hastings offers over 60 undergraduate degree and 14 pre-professional programs, that latter of which include fields like dentistry, physical therapy, and actuarial or statistical science. Students may also choose to craft their own degree, catered specifically to their skills, interests, and goals, through the Personalized Program track. Hastings stands out among many other Nebraska colleges for its dedication to experiential learning. For example, the Thrive Leadership Program allows students to build their communication and ethical decision-making skills through work with the local community. Students may also join the Excelsior Scholars Program, getting the support and funding they need to pursue their own research and present their project at the national level. Additional opportunities for study abroad and internships with community partners are also open to all Hastings students. Established in 1890, York College offers a number of on-campus and remote degree programs, allowing all students to pursue higher education and career training. Like other Nebraska colleges, traditional students at York can study areas such as accounting, middle grades education, vocal music performance, and communication with three different empahses. With the creation of York College Online in 2010, distance learners can choose from undergraduate and graduate degrees in business administration, criminal justice, and more. Academics aside, students also have the option to engage in the school’s vibrant athletics and fine arts programs, whether that be playing on the Panthers basketball team or performing in a theatre department production. Several institutional scholarships are available, ranging from the $1,500 Blue & White Award to the full-tuition stipend of the Presidential Scholarship. Founded in 1894 and located in the the city of Seward, Concordia University- Nebraska is a coeducational school offering academic programs for undergraduate- and graduate-level students. Concordia is a comprehensive university, offering students the opportunity to study all varieties of fields and disciplines, from exercise science and public health to theology and business administration, just to name a few. Students of all backgrounds and interests will find a place at Concordia. Those who pursue the creative and fine arts will find the school’s theatre, music, visual arts, and speech programs to be among the most accomplished in the state. International students will discover a supportive place as they access help through the Academic Resource Center and enroll in Concordia’s intensive English program. Many of Concordia’s master’s programs can be completed entirely online or in a hybrid format. Concordia is one of the best colleges in Nebraska in terms of financial funding; 100% of students receive grants and scholarships from the school, making this private institution very accessible. For over 100 years, Wayne State College has stood behind its commitment to provide accessible education for all students. 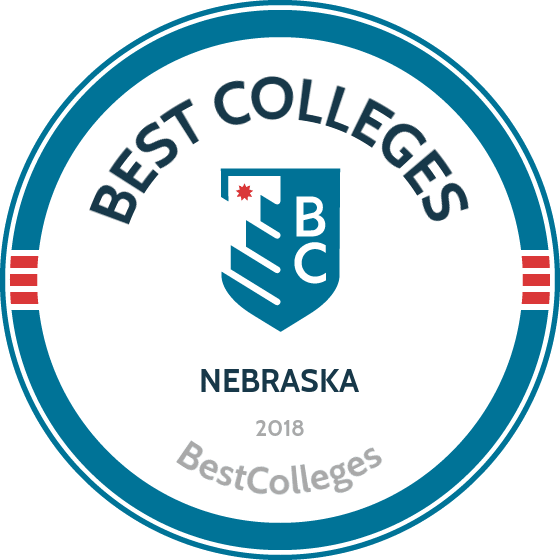 Today WSC is one of the most highly-ranked colleges in Nebraska, enrolling roughly 3,500 students. Through its four distinct schools, WSC offers over 90 degree programs, including undergraduate, graduate, and pre-professional tracks in areas such as agriculture, engineering, biomedicine, and the liberal arts. Students with clear goals in mind will find specialized programs that supplement a traditional college education with professional development training, work experience, and networking opportunities. Those interested in the healthcare field can jumpstart their careers by enrolling in the public health track or by participating in the Rural Health Opportunities Program. Students who want to give back in other ways can turn to the Rural Law Opportunities Program, which prepares them to be advocates for the working poor and other underserved populations. Union College opened its doors on September 31, 1891, and since has grown into an institution dedicated to community service and academic excellence, offering more than 50 degree programs and emphases in 27 fields of studies, including arts education, small business management, web development, and engineering. Union is one of the best colleges in Nebraska for those interested in pursuing a career as a physician assistant (PA). The PA program prepares students to take care of patients similar to the way a doctor does, but with much less schooling -- a total of six years -- during which they’ll earn a bachelor of health science and a master of physician assistantship. All Union students receive the academic and professional support they need, including advising and counseling services, career assistance, access to campus ministries, and the option to join the Honors Program and other campus organizations. The total cost per year for an undergraduate student is approximately $30,000, which can be reduced through several opportunities for financial assistance. Located against the underside of Nebraska’s beautiful Pine Ridge and just 28 miles away from Fort Robinson State Park, CSC enrolls over 6,000 students annually. The school offers a wide variety of academic programs, including degrees in geoscience, business, American Indian studies, and family & consumer sciences. Distance learning opportunities are also available, enabling students to earn their bachelor’s or master’s degree completely online, and many courses are offered in a convenient accelerated eight-week format. CSC is also one of the very few Nebraska colleges to offer programs in agriculture and rangeland management. With four degree options, students can pick the one that best suits their future goals, whether that be a career in in agri-business or graduate-level research on rangeland ecosystems. Tuition is low for state residents and through the Eagle Rate program, qualifying undergraduate non-residents pay only $1 per credit hour more. Academic support and services are open to all, including a personal advisor who will help you through the application and transition processes. Peru State College began in 1867 as Nebraska’s first institution of higher education. PSC enrolls over 2,400 students in fully-accredited academic programs that prepare learners to become successful professionals and civic leaders. Undergraduate degree options include graphic design, social science, music marketing, criminal justice, wildlife ecology, and computer and management information systems. The school also offers two master’s degree programs in education and organizational management. PSC stands apart from other colleges in Nebraska for its special programs which support students studying rural and public health. PSC welcomes nontraditional learners and offers asynchronous online classes and remote degree options. No minimum GPA or standardized test scores are necessary to apply as an undergraduate. Graduate candidates must have a minimum 3.0 GPA. Bellevue University was founded in 1966 and follows the teaching philosophy known as Skills to Performance, which emphasizes education and practice based on industry guidelines, thereby preparing students properly for dynamic careers in their field of choice. A number of in-class and online program options are available, including degrees in software development, nonprofit management, and cybersecurity. The school is also the only one among Nebraska colleges to offer a PhD in human capital management to distance learners. With a 100% online curriculum based in extensive analysis of literature and original research, students can gain the skills they need to structure and lead their employees to better organizational performance. Non-degree programs through the College of Continuing & Professional Studies are also available, including courses on substance abuse counseling and general leadership. To further emphasize the Skills to Performance ideal, Bellevue partners with national organizations like the Center for Cybersecurity Education, enabling students in the field to access networking opportunities, job prospects, and more. Located in Fremont, Midland University enrolls approximately 1,400 students through 34 academic programs. Undergraduate degrees include sports management and marketing, natural science, arts management, and RN-to-BSN. Midland also offers master’s degree programs in education, athletic training, business administration, and adult and organizational learning. The university stands out from other schools in Nebraska for its four-year graduation guarantee, which helps ensure that students meet all academic goals within their degree term. This includes covering all costs if earning the degree takes longer than projected. Students have opportunities to grow through participation in more than 30 clubs and organizations. Each student pairs with an admissions adviser who helps them with the application and credit transfer process if needed. Midland University offers affordable tuition rates and generous financial aid packages regardless of residency status. Institutional grants and scholarships for first-year students are also available. As of 2014, over 39,000 students were enrolled in the state's public community colleges, the largest being Metropolitan Community College with 14,675 students. Overall, students working toward their associate degree represent 32.8% of all degree-seeking students. With an average annual fee of $3,185, it's no wonder so many students are electing to take advantage of the opportunity to save money before transferring to a four-year institution. Many students who are working while completing their educations also choose to follow the community college route; as of 2014, 59.2% of all students at two-year institutions were attending on a part-time basis. NCC was created by the state legislature in 1973 as a comprehensive two-year institution, and today is one of the best community colleges in Nebraska. Approximately 98% of graduates land jobs in their field or pursue further education. NCC has campuses all over the state of Nebraska, each offering a range of course options, comprehensive student services, and its own distinct features. Located in North Platte, Mid-Plains Community College is a lively institution with many of the same characteristics as a four-year university, including residence halls and 10 intercollegiate athletic teams. MPCC offers a large catalog of degree and career-training programs, from technical areas like dental assisting and building construction technology to associate degrees in the fields of science and arts, among others. MPCC also stands out among community colleges in Nebraska for its dedicated transfer degree disciplines, which allow students to take the core and prerequisite courses they need before transferring to a four-year university. For examples, students who want to pursue a career in pharmacology or mortuary science can opt for the biology track at MPCC, taking the necessary courses like math and organic chemistry they’ll need to continue their education. Students can also plan for their future by taking general education courses through MPCC’s Sunday College program or online classes through the Center for Enterprise. At $109 per credit hour for out-of-state students and even less for residents, tuition is very affordable and financial aid is available for everyone. Home of the Raiders athletic teams, CCC is located in Grand Island and offers over 30 technical, career-training, and associate degree programs. Because it is a comprehensive two-year school, several areas of study are available, including anthropology, dental hygiene, nursing education, and visual communications. CCC stands out among other two-year colleges in Nebraska for its mechatronics program, which allows students to apply their study in pneumatic and hydraulic engineering to design, maintain, and repair all types of industrial machinery. Students can tap into all kinds of financial aid, from traditional FAFSA-based grants and loans to additional assistance for veterans and active military. The school boasts a flexible transfer policy, allowing students to use credits they earned at other community colleges towards their degree at CCC. They can also transfer all applicable work to a four-year university before they even finish an associate degree. A college of the Winnebago Tribe, Little Priest is one of the top community colleges in Nebraska that offers a variety of programs embracing Native American heritage. The school offers associate degrees in early childhood education, teacher education, and interdisciplinary studies. Several associate of arts programs incorporate Native American culture or indigenous science. The AA in Native American studies includes a curriculum designed to increase students' understanding of the Winnebago, Ho Chunk, and other indigenous cultures. The program also allows students to specialize in their own tribal history. The AS in indigenous science offers two plans of study: health and the environment. In both options, students engage in classroom learning, lab work, and field experiences that enhance their understanding of the natural world from scientific and cultural perspectives. As its names suggests, NCTA is a specialized institution dedicated to providing hands-on education to those interested in modern agricultural careers. Located in the city of Curtis, the college offers 18 associate degree programs in fields such as animal husbandry, livestock industry management, dairy production, and equine health. NCTA stands out among Nebraska community colleges for its dual-enrollment options for high school students. It has a dedicated transfer agreement with the University of Nebraska at Lincoln that guarantees students in certain degree tracks, like horticulture and veterinary technology, the ability to transfer to UNL with junior status. Nontraditional students and working professionals can also pursue general and topic-specific education by taking online courses year-round. Veterinary technicians, for example, can advance their careers with classes in radiation safety and exotic pets selection. Financial aid is available, including private awards like the dean’s and nonresident scholarships. If you're thinking about applying to one of the best colleges in Nebraska, continuing reading to learn more about living in the Cornhusker State.